Know Whitmer Class of 1979 graduates that are NOT on this List? Help us Update the 1979 Class List by adding missing names. There were so many, 79 was the year of some of the hottest girls ever. Just a few, Liz Douglas, Debbie Brabhan, Judy Dacey, Laura Kujda, Sandra Milburn, Wendy Miller, Peggy O'brien, Kelly Pahle, Patti Postlewait, Darlene Schuler, Karen Stutz, Brenda Swallow and Peggy Vrahiotes to name but a few of the many hot girls of the class of 1979. Does any body remember the tennis courts or should I say does every body remember them. How did we all graduate. Mrs. Sirilo, Cosmotology teacher, not sure I got her name correct. awesome teacher with respect for the unforseen, She is in many of our hearts always, and I was her worst student and I will always remember her with love. Friends, Music, Food and Fun! It�s Fiesta Time at Centennial Terrace! (cost of dinner is included in ticket price/cash bar will be available). This event is rain or shine � NO REFUNDS. ALL PAMENTS MUST BE RECEIVED by August 1st, 2009. (Whitmer VS Fremont Ross at Home). For info call, 419/473-8348 or see website listed below. For more detailed info and to confirm in advance that you will be coming, please go to http://www.*****/****. More 1979 alumni from Whitmer HS have posted profiles on Classmates.com®. Click here to register for free at Classmates.com® and view other 1979 alumni. 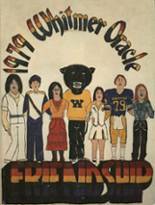 Missing some friends from Whitmer High that graduated with you in 1979? Check the list below that shows the Whitmer class of '79.